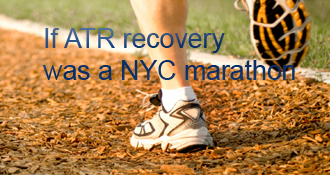 kiwibug has completed the grueling 26.2 ATR miles to full recovery! So last Saturday marked the 6 month date from my surgery. I feel like my leg is about 80% healed and I really have very few problems or issues any longer. It still feels a bit stiff and tight some days, but I have pain only occasionally and don’t generally even think about my Achilles during a normal day. I am back hiking again, steep hikes over rough terrain. I feel an ache in the Achilles going up a very steep slope, but other than that it just gets tired quickly and I need about a day after hiking for it to recover. I am also back playing volleyball. The first time was very stressful and worrying and I barely moved on the court. However, I have played 4 times since there and I am moving around well, almost at pre-injury levels. I haven’t done any jumping yet, but I can play and go for the ball without worrying now. I did a 5km race last week. I didn’t run at all, but I walked it at the same speed that I walked last year before the injury so that felt good. I had no pain during or after the walk. So over all I feel mostly recovered. I have managed to run across the road and to catch a bus but haven’t been running yet. But that is not something I usually do anyway. I still can lift my heel only a short distance off the ground as a single leg lift, but at least I can get it off the ground for a reasonable time now. This website was amazing early on during this injury and it really helped me during the recovery stage. However, now that I feel pretty much recovered I rarely visit this site. I am too busy going out and doing things these days! I might pop in occasionally to see if there are questions I can answer, but I (hopefully!) won’t be here posting on here again. I haven’t updated recently as I haven’t had easy access to a computer, plus I have been on vacation, but today is 19 weeks since my surgery and I am happy to report that life is pretty much normal again! My walking is normal and except when I get occasional heel pain seems to be limp free. I can walk normal speed again and can even walk fast when required. While on vacation I even managed to jog to catch a train. I can walk downstairs properly again. I have been able to put one foot on each step since being in 2-shoes. However, I was always going heel first with my bad leg. About 3 weeks ago I started trying to walk normally downstairs, putting my toe first and then dropping the heel down. It was very hard at first and even when I could do it without difficulty I still had to think about it else my heel went down first. Now, I can do it without thinking and am comfortable going downstairs without a handrail again. On holiday last week I did a lot of walking and standing so I had swelling each night, but very little pain. I also managed a short hike, only about 15 minutes, but it was on a proper uneven hiking trail with stones and I had no problem. I plan to start real hiking in the next month, although I will start with easy ones. I usually hike with poles anyway so they will help. I am also hoping to start playing gentle volleyball next month. I can do squats without any trouble now and even squat right down to the ground (useful for the local toilets!). I am riding a bike to work daily and can even make it up the hill to my apartment on it. I am doing squats including one legged ones, lunges and heel raises for exercise everyday. I can comfortably do a 2 legged heel raise without any support. I am lowering on one leg but I can’t do it from the top of the raise without some support yet. I can’t do a single legged heel raise although I can get my heel off the floor finally. I have a slight sign of visible calf muscle but it still needs lots of work to get stronger. I won’t be jumping or running for a while yet, but they are not things I really do anyway. I don’t think about my Achilles most of the time anymore. I no longer have to wonder if I can do something or not, I can just go and do it which is very liberating. Overall I am pretty happy with my progress. Tomorrow will be 14 weeks since my injury. I am walking pretty normally now. I have some pain in my achilles/calf which comes and goes. When it is pain free I don’t have a limp and can walk at a normal speed too. When the pain comes I can only walk slowly without limping. I will be heading out on my bicycle starting this week. I am walking up and down stairs like a normal person now and no longer have to use the lift to get to my 3rd floor classroom. I had a session with a physiotherapist last week. He spent most of the time on deep massage as he said that is more effective than stretching. It really helped to loosen up my muscles and made walking easier. If it wasn’t so far away I would try and have it regularly. Instead he showed me how to do it at home, which is less effective but better than nothing. Basically, I press and roll my leg on a rolling pin. He also gave me some core muscle exercises to do. And suggested doing ROM exercises (front to back, side to side and rotations) standing on the bed to give an unstable base. Also standing on one leg on the bed as well as on the floor. Other exercises I am doing regularly are theraband stretching, standing heel raises on two legs (these are getting easier but still difficult and uncomfortable), squats, standing on one leg and cycling on the exercise bike. All in all I am happy with my progress. I wish there was a bit less pain, but it is not too bad and not always there. I feel I need to really work on strengthening my leg now so that I can get back to doing sports and hiking after the summer. Today is 11 weeks since my injury and tomorrow will be 11 weeks since the surgery. Yesterday I walked outside in 2 shoes for the first time! It was rather scary but otherwise fine. For the past week or so I have been comfortably walking around in my apartment without the boot. I have been taking it off at the door like a regular shoe and not using it at all at home. I was walking around in bare feet most of the time and occasionally putting on 2 shoes for a bit of practice. I have never had any heel wedges for my boot, so it just seemed natural to walk in bare feet at home. I also managed to get rid of the chair for showering and to stand up and take a shower like a normal person which was a good feeling. On Wednesday I walked to work wearing my boot. It is just over 1.5km and it only took me a couple of minutes longer than pre-injury. I saw the doctor last night and he told me that my tendon looks nearly normal and is strong so to start walking without my boot. That is a lot earlier than his original prediction of 3 months on the day of my surgery. He also told me that it wasn’t too long ago that he gave people casts for 3 months after this surgery! So I decided to finally brave going outside last night. There is a supermarket about 5 minutes walk from my house at normal walking speed. The road to it is not too uneven apart from the steep hill up to my house at the end. My husband met me at the shop with my other shoe and my hiking poles and I took off my boot and walked up the road. It was completely terrifying but not painful. I changed back into the boot to get up the hill as it is still a bit hard to do it even in the boot. This morning, I walked down the stairs (bad foot first), down the hill and to the supermarket all with 2 shoes and without my hiking sticks. It took me about 10 minutes instead of 5 so I am quite happy with that. I put my boot back on to teach, as someone has polished the floor in my classroom and it is super slippery. But since classes finished I have been walking to and from the teachers’ room in my regular shoes. I feel a bit unsteady in my shoes and a short walk is much more tiring so I will continue to use the boot sometimes for a week or so, but I hope to finish with it soon. I have also found a physio to visit next weekend. It is about 4 hours away on the bus, so I am hoping that they are good and can give me plenty of exercise tips to take home. So last Wednesday marked the 2 month date since my surgery. I saw the doctor who told me that my walking in the boot was normal which was excellent. I feel comfortable walking in the boot now but I still can’t manage to get much past 1km in a single walk. I am still trying to increase the range slowly but my leg gets tired and sore at about that time. My walking is slow, but as long as I take small steps and think about walking then my gait is pretty normal. I am lucky that my boot doesn’t have a very big sole so the uneveness between the boot and my shoe is pretty small. I am comfortably sleeping without the boot now. And I have been standing in bare feet for about a week and gradually transferring my weight onto my bad foot. But I hadn’t taken any steps without my boot. On Thursday morning I wanted to get a sock so I could put my boot on. The socks were about 3 steps away and I really didn’t want to put the boot on to get them and then take it off again. So I decided to go for it and take the steps without the boot, but using my crutches for security. I had no problem putting most of the weight on my bad foot but I was shocked by how weak the leg felt. Since then I have been increasingly not using my boot around the house. I can manage to get around without crutches now, but I don’t feel comfortable with walking yet so I think it will be a while before I go outside without the boot. I don’t have much of a limp but every step seems like a big effort. Although the first few steps with the boot were the same and now walking in that is easy so hopefully it won’t take long for improvements to show up. I haven’t had much pain. I get occasional short pains in the Achilles but they never last for more than a minute or so. My heel sometimes feels sore, especially when I walk a longer distance. My calf muscle ached terribly for most of last week but has eased off now. I am still getting knee pain some of the time too. My PT has hinted that he might give me some exercises when the boot comes off. If he doesn’t then I shall stop going. I wish I could find a better one, but it is not possible where I live. At least there is useful information available on the internet. Overall I am happy with my progress, but I also feel like there is still a long way to go. As they say in Korea "화 이팅 (f ighting)!". I saw my doctor last Tuesday and he told me that I would be able to lose the crutches within 2 weeks. I was a bit skeptical at the time, but made a conscious effort to put more weight on my leg with each step. On Wednesday and Thursday there was an ache in my calf muscle, presumably because it was finally being used! On Friday, I had a free afternoon at work so I decided to try walking down the corridor using only 1 crutch. I carried both, but managed to take a few steps with only one crutch and not resting too much weight on it. The next day I was walking comfortably with 1 crutch and managed to take a couple of wobbly steps without leaning on it at all. They were really more like a shuffle than walking but it was still FWB. By the beginning of this week, I was comfortably walking around the house without my crutches, but was walking much better when I was using 1 crutch. For this week, at work I am still using 1 crutch (it helps fend of the little children and is good when I get tired), but am happily walking without it and as long as I take small slow steps, my walking is fairly good and no longer a shuffle. So I didn’t really believe it would be possible when I saw the doctor last week, but I have successfully transitioned to FWB. I have little pain in the Achilles, although it does feel tight. It is also quite swollen at the end of the day, but the swelling goes down quite quickly. I have had a bit of ankle pain and quite a lot of knee pain (a residual effect from my previous ACL surgery combined with the fact that my quad has shrunk a lot). I have been using my exercise bike daily to try and help build muscle strength, especially in my quad. And walking about 1km per day as well. So at this stage, I am happy with my progress. I hope it continues to go well. After being allowed to go home from the hospital 18 days after having surgery, I mostly just rested at home with my leg elevated for another couple of weeks. My husband did a good job of looking after me and when he was away on a couple of trips I managed ok by myself. I used a computer chair on wheels to move food from the kitchen to the dining table. This also gave me somewhere to sit and rest while I was in the kitchen. And a chair covered in a large trash bag for sitting and taking a shower with another bag to cover my cast. My apartment has some tricky stairs to negotiate to get in and out of it and it is at the top of a small hill. I don’t have a car so all of these have contributed to me not getting out and about much during the first 5 weeks after surgery. Now I am more confident on the stairs, although still wary, and I can walk down the hill to the main road and catch a taxi so I am able to go out other than to visit the hospital. This definitely helps with a feeling of getting back to normal. On 6th May, not quite 4 weeks after the surgery my cast was removed. The doctor looked at the Achilles and said it was healing well and I could go into the boot. I don’t know the kind of boot, but it has a metal rods attached to a wheel on each ankle which allows adjustment of how much the boot can flex, and lots of velcro straps. It hurt putting the boot on for the first time, as with the cast my foot was pointing downwards but t he boot is set in a near normal foot position. The pain was just from some stretching and it didn’t last long. I was told to be PWB but I was rather tentative at first. I did have terrible knee pain for a few days. My knee had severely stiffened up from being in the cast and it took about 1 week of doing knee exercises to get the full range of movement back in my knee. I started physiotherapy the Monday after getting the boot. This consists of heat, interferential electrotherapy at the same time as infrared therapy. All these are supposed to improve circulation. After the heat therapy sometimes the physiotherapist massages my leg. There is one spot on my calf which is very painful during the massage, although it does seem to be improving slightly. I was also told to do ROM exercises (just move my foot gently up and down) at home. I am having this physiotherapy 3 times a week. I have also been doing leg lifts (without being told) ever since the surgery. Lifts lying on my back and on my side wearing the boot and the cast before that. I am still PWB, but am trying to increase the amount of slow walking I do. I can manage about 500m before being too tired. It has just got really hot here which doesn’t help. I have just ordered an exercise bike and plan to start using that daily from this week. Last week I went back to work which was rather scary. I teach at elementary school and I was very worried about the students running into me. But they have been very respectful of the crutches. Apart from being exhausted at the end of each day, it has gone very well. So now I am 6 weeks post surgery. I am still PWB in the boot and have been told I will ditch the crutches within 2 weeks. I am trying to increase the amount of weight I put on my foot but I haven’t been brave enough to try FWB yet. I have pretty much a full range of motion back in my foot, after it is warmed up. I have a little swelling around the Achilles which increases to a lot if I have my foot down for too long, but goes down quite quickly on elevation. I am still sleeping in the boot as it doesn’t bother me and I move around a lot during the night. I ruptured my Achilles on April 9th playing volleyball. I wasn’t doing anything impressive just stepping forward to receive the ball when my leg collapsed. I didn’t hear a pop or feel like I had been kicked, my leg just gave way. When I stood back up my foot felt wrong so I was pretty sure I had done something serious. It was pretty painful too. One of the other members of my volleyball club took me to the local orthopedic hospital, but because it was evening the doctor had already gone home. A nurse gave me a kind of plaster cast and told me to come back the next morning. I am currently working as a teacher in South Korea so this entire process was conducted in a language which I don’t speak well. Luckily I understand more than I speak so I was able to get by. That evening I did some research on the internet and I was pretty such I had torn my Achilles. It was pretty sore and I was worrying a lot so I didn’t get much sleep that night. A Korean friend gave me a ride to the hospital the next day but she had to go to work and my husband was on a business trip that day too so I was on my own at the hospital. When I arrived they were expecting me. I stand out as the only foreigner patient they have! They gave me some x-rays and the radiographer didn’t look too impressed with my injury. I know that x-rays are not necessarily the best way to identify a ruptured tendon, but they love them over here and seem to give them way more often than other countries in my experience. I then saw the doctor, who I was very relived to learn speaks English. He took a look at my leg and told me straight away that the Achilles was completely torn. He said that I needed surgery to repair it and that it was a very simple procedure and he could do it that morning. I already knew that surgery was probably the answer from my research the previous night, but I wasn’t expecting to have it done quite so quickly! I was hustled off for a CT-scan - I don’t know why. Then in to be prepped for surgery. The hospital staff were very nice but only the doctor spoke English so everything else was done in Korean. I was actually quite glad that it was all rushed through as it didn’t really give me any time to worry. I had a spinal anaesthetic for the surgery. I was amazed that they were able to make my left leg completely numb, but leave some of the feeling in my right leg. It was very weird seeing my left leg in the air as they moved it for some reason, but feeling as if it was still on the table. The surgery took just over 30 minutes and when it was finished they showed me some photos of the Achilles before and after. Then put me in a full leg cast. It was only at that point that I realised what a long recovery it would be. That was when the doctor decided to tell me that I would need the cast for 1 month and a boot for 3 months. I was told that I had to lie completely flat and not even lift my head for 12 hours. I found out later that this is to reduce the chance of a headache from the spinal anaesthetic. I was offered painkillers for an extra fee. The price was quite high (about $120) but I said yes. I was sharing a room with a female monk, who told me that I shouldn’t take painkillers until I was in pain, but I opted for pain prevention. The painkillers were in the form of a drip for about 48 hours. I don’t know if they were good ones, or if I was just lucky but I had very little pain in my leg. I did suffer from quite bad back pain during the first day, but I think that was partly having to lie flat for the whole time. I also had a kind of frame to keep my leg elevated the entire time, which meant that I had little swelling. After 12 hours (about midnight) I was allowed a pillow and some water. The next day I was allowed to sit up slightly, but was not able to get out of bed for 4 days until they gave me some crutches. I was informed that I was strictly NWB. I had ACL surgery in New Zealand about 10 years ago. The ACL surgery was on the same leg, but I don’t know if the injuries are related at all. When I had that surgery I was only in hospital overnight, so when I was told I would have to stay in hospital for 2 weeks it was a big surprise. The reason given was that I needed daily antibiotic injections. Actually staying in hospital wasn’t too bad, apart from the food which was not that good. My husband came to visit every day and several friends also dropped by. The thing that is very different about hospital in Korea is that the nurses do the health stuff only. They give drugs and take blood pressure etc. But family members come to the hospital and often stay there overnight to help with caring. They take patients to the bathroom and wash them, not the nursing staff. People also seem to stay in hospital when they don’t really need to. One of my roommates used to go home for part of the day and then come back to the hospital just to sleep. Another one, an old lady couldn’t be persuaded to go home for several days even though every day the nurses and her family tried to tell her that she would feel better at home. The hospital had a daily routine. We were woken up by a nurse around 6.30am for an injection in the bum. A drip was started which would continue until early afternoon. 7am was cleaning time and 8am was breakfast. Around 10am the trainee nurses would come and take our blood pressure. Lunch was at 12. Around 2pm the drip would be finished and removed. This was always a good time as going to the bathroom with the drip was a big pain. It was attached to a wheely pole but I would have to push the pole and then take a couple of steps on my crutches. It was so much easier in the afternoon when I just had to use the crutches. Around 3pm the dressing nurse would come and change my dressing. The day I had my surgery and the cast fitted they cut a door at the back. So every day he would come and take the door off and change the dressing. Around 4pm the doctor would come round and say "any problems, no, good". That was all I saw of him, but I know the nurses kept him informed. Dinner was around 5.30pm and another injection in the bum at about 7pm. At around 2 weeks I had the stitches out, half one day and the remainder two days later. And finally 18 days after the surgery I was permitted to go home. Congratulations on your “commencement”, kiwibug! keg27 I am glad that my post was encouraging. I agree that this site has been incredibly helpful with this recovery. Regarding shoes, I have been wearing my regular shoes since the start of walking in 2 shoes. However, my regular shoes are keens (like this http://www.keenfootwear.com/product/shoes/women/newport-h2) - they are all I wear. I have both a sandal and a shoe (with a back to the heel). So I can’t really say about heels, and regular shoes, sorry. Why don’t you try wearing them around the house for a while and see how they feel? Kiwi, congrats on your progress! Reading your post was very encouraging for me. It’s tough to explain to someone who hasn’t experienced this injury how difficult stairs are now. I am 16 weeks post surgery and have a silly question. I’ve been wearing sneakers/running shoes and nothing else for about a month now as I adjust back to walking normally. My heels, flats, and sandals have been collecting dust and my co-workers are used to seeing me in a dress and sneakers, haha. Are you able to wear “regular” shoes at this point? If so, when did you transition? Thanks! blahblahblah2k2 thank you for your comment. I am also quite active and not much of a sitter. Until the last couple of weeks I was very wary of stairs and I wouldn’t go downstairs without holding on to the handrail. I can’t do a one legged heel raise yet, but I can lower on one leg which has really helped with being able to tackle stairs normally. I don’t have to ice after cycling. In fact, these days I am mostly not icing - I am getting only a little swelling and it goes down overnight without icing. The only time I have to ice is if I have done a lot of walking or standing during the day. I still have pain some days, but not very often any more. I am sorry that you are still having pain. This is very motivating. Thank you for sharing. I’m at 24 weeks and I still have issues with stairs. I just got over the fear of curbs. My problem is I can’t sit still. I’m too active and hardheaded. So at 24 weeks I should be able to forget all of this but the pain is still there. I have to ice it down after any workouts involving that leg. Did you have to ice it down after cycling? Thanks for the update and congrats on all your progress! I think it is just bluster and people here aren’t really worried. I am a long way from the border too. Good to hear from you again. Hope other things are safe for you at the moment as well. We are hearing a lot about rising tensions and shots fired. Stay safe. I rode the bike ok yesterday and it was ok, although I don’t feel very confident on it yet. Kayrnnz I had surgery the day after my injury. When I did start walking it was hard because of being afraid but it was never very painful. My leg felt very weak too. Maybe you just need to give it a little more time. Trying with crutches to help you at first is a good way to start doing it, then dropping down to 1 crutch and then gradually stop using them. Congrats Kiwibug, sounds like you are doing great! I have been on two PT sessions a week but I am going to drop down to one now that I know most of the exercises and can do them at home - just like you. Good luck on the bicycle, and good luck with your continued recovery! Congrats on this milestone, kiwibug. I hope the PT works out too. I won’t be going regularly, I am hoping that they can give me a bunch of exercises to do for a month or so without returning. I am feeling a bit more steady now, having walked around a lot at the weekend. I also made it up the hill to my house and down the stairs, one foot per stair. Yay! I am so happy for you! I understand the feeling unsteady. I feel the same way, especially when my foot swells. I am glad you found a PT. I hope they are able to help you out. To be quite honest, the things I have been doing at PT seem to be standard ATR rehab protocol which can be found all over the internet. Eight hours round trip 2-3 times a week is quite a trek. I feel PT is crucial to a full recovery but I believe once you know what to do it can be done solely on your own at home. I wish you luck and hope you get lots of good instruction so you don’t have to make that long bus trip very often! crawllimpwalkrunjump you are pretty much describing how I felt about walking outside with the boot. Going out for the first few times was so much harder and scarier than walking around inside. But it soon improved and my walking has got faster and easier. My plan too was to travel somewhere with a fairly smooth surface for my first steps boot free outside. missterik I understand what you mean about the walker. To start with for FWB in the boot I was using one crutch as it made me much more balanced and I felt safer. I will probably take it out again with my when I venture outside boot free for the first time. Using a walker has enabled me to dare to venture outdoors. I don’t need it for weight bearing, more for balance and I feel so secure on the uneven pavement with it. I really didn’t want to use a walker but I am glad I was convinced (by my brother who is a PT but lives in another state) to give it a try. It has made all the difference for me. Otherwise, I would be stuck in the house 24/7 since I have never been able to use a boot. My biggest fear, as I am sure is yours as well, is falling and rerupturing. You will be outside without the boot before you know it! Be careful! I will let you know when my PT gives me new exercises. crawllimpwalkrunjump thank you for your support.. I am already walking better around the house than I was a few days ago. Staying away from uneven surfaces worries me a lot as it is impossible to do around here. All of the pavements (sidewalks) are extremely uneven, so I feel that I need my leg to be stronger before I go outside without the boot. missterik thank you for the description of your exercises. I think I will hold off on the stretching for the moment, but the other exercises all seem possible. I have done some more research on PT and discovered that the treatment I am getting is pretty standard in Korea - they don’t do much of the exercise style PT here. I also used a rope with a foot stirrup attached to slowly stretch the achilles. I did this 10 times, holding each one for 20 seconds. However, being you are only at 8 weeks, I would check with your doctor before stretching. I am not certain, but I think I read that it is at 12 weeks post-op when it is safe to start stretching. Too soon is no bueno. I also rode a recumbent bike for 20 minutes. Walking around the house is absolutely the first and best self therapy you can do. Practice practice practice. I can’t tell you how many circles around the house I made. But it always prepared me for those first steps outside…first day outside can be an incredible struggle. But the best way to look at it is…take your time, stay away from uneven surfaces, and realize it very very necessary pain and struggle to get to day 2 outside then day 3, then 4. Sometimes a simple walk around the block made me confident and happier. But you will be stunned when the speed picks up, the limp starts to fade, and you start feeling like yourself again. Takes patience and confidence in the big picture. The greatest feeling I had recently…was simply going to the local store and back..on my own. Took me 30 minutes. but I made it. Now it takes me under 15. Soon..5. Missterik it sounds like things are progressing well for you too now that your incision is healing. Thank you for the description of your stretch. I understand what you mean and will give it a go after my next set of exercises. I would love to hear what new exercises your PT gives you. I also saw the PT today, who asked me if I had any pain or problems. When I said I didn’t he wondered why I had bothered going to the hospital then! So, I feel like I am on my own with the PT. Therefore, the support from this site is greatly appreciated. I hope your recovery continues well too. I have been using the bike with the boot. And have been keeping pressing down through the heel while I cycle. I think it is really good exercise and I wish I had started a bit earlier. I am comfortably walking without the crutches now. And the doctor is happy with how I am walking but he wants me to keep the boot for a bit longer yet. I am happy with wearing the boot as it means I can do a fair amount of walking each day. And I have tricky stairs to negotiate every day, some of which don’t have any kind of bannister. I think I will wait and listen to my doctor’s advice of when I can ditch the boot. I am sleeping without the boot now too which is more comfortable. I completely have ditched my boot….my physio said only wear it if you are “going out to get drunk and acting a fool”. For reference, I ditched them at the end of Week 6. I did it yesterday (for the first time and only for 10 minutes) without a boot and felt fine. But if you have any pain/burning, she said to stop. Not sure about the week 3 or 4 but your in 7 and 8 so your tendon should be healing along fine. Do you use your boot on the exercise bike or go without? I was trying to get a sense of when people start biking and came across one guy who tried biking with no boot at 3 weeks (didn’t go great) but then by 4 weeks was doing it regularly! Hey, great to hear the news! Also great to hear someone else in the world had a torn ACL and torn achilles.. though I actually need another ACL repair once I am healthy enough from this torn achilles! Great work on the FWB. I had the same push (albeit from my roomate who pushed me to ditch the crutches and FWB, rather than my doctor… smart right?). I quickly transitioned out of the boot after I could FWB and was in two shoes permanently at the end of week 6/7. I hear the quicker you do that, the quicker the recovery (obviously being very safe while walking). Best of luck to you and can’t wait to hear your progress! I have had the nodes in several places. The first couple of times they were near the Achilles on either side. The next couple of times were higher up on the upper calf. The last couple of times were on either side of my foot, in front and directly on the Achilles. I have been told that it is to help with improving circulation so I guess they want to move them around a bit to try and improve the circulation all through the area. I can feel the buzz from the electricity during the treatment which lasts 15 minutes but it is not uncomfortable or painful. where they they hook up the Interfererntial nodes? near the achilles or near the upper calf? I have a handheld machine that has that mode along with microcurrent that I use for back pain and curious if I should use on the calf. Michael67, yes I have been pleasantly surprised by the level of health care I received in my local countryside hospital. The hospital is not at all fancy but the care was good and soooo quick. I am sorry to hear that you didn’t have a good experience in the hospital for your Achilles surgery. Thank you for sharing. My daughter taught English for a year in Korea and was taken ill twice. While it was nothing as serious as what happened to you, she found the Korean doctors and nurses to be very efficient and she was very impressed even though she didn’t speak Korean. The experience that I had with my hospital stay for my Achilles tendon surgery was not good and this was in the U.S.
kiwibug’s AchillesBlog is proudly powered by WordPress and WPDesigner..